Overdrawn at the Exposure Bank: Now That The Preseason Is Done, What Do We Know About The Timbers? 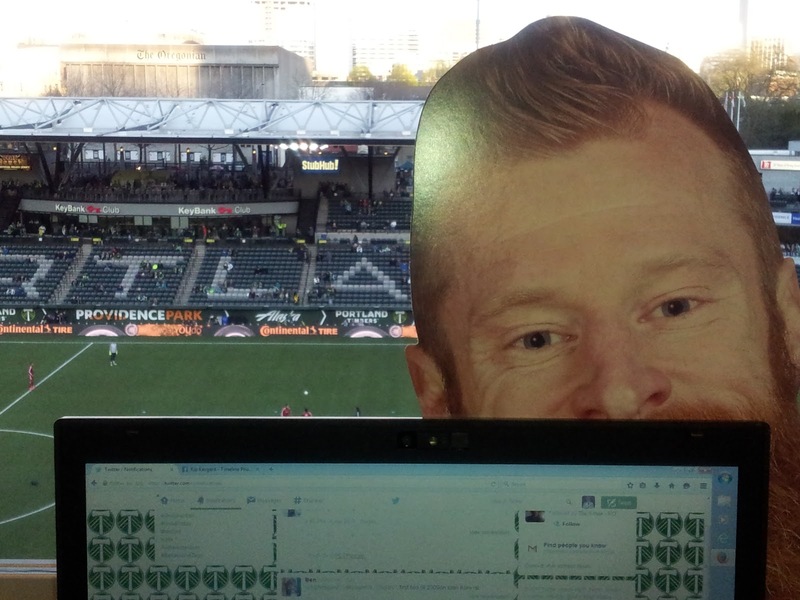 Now That The Preseason Is Done, What Do We Know About The Timbers? So the 2018 MLS pre-season is done for the Portland Timbers with 2 wins, 1 draw and 2 losses in 5 official matches in Arizona. While traveling back to Portland for a week of training and playing a few other unofficial matches down in Arizona, local fans have had to rely upon web feeds of matches and Twitter updates to learn about their favorite MLS club so far. Normally, the Timbers have a local pre-season tournament on site, but they weren't able to do this because of construction at Providence Park for the planned expansion of the ground's eastern wall. Suffice to say, it's made for an oddly disjointed preparation to 2018 - normally by now, there would have been an open practice and full media day to get to know the team and coaches. While the end result of the construction will be awesome to add seats to the park, the timeline not only impacts the pre-season but the regular season schedule - home fans won't see the Timbers at home until April 14 in their sixth match of the year. Portland will have already played on the road against the Los Angeles Galaxy, New York Red Bulls, FC Dallas, Chicago Fire and Orlando City SC before Minnesota United FC travels to the Rose City. 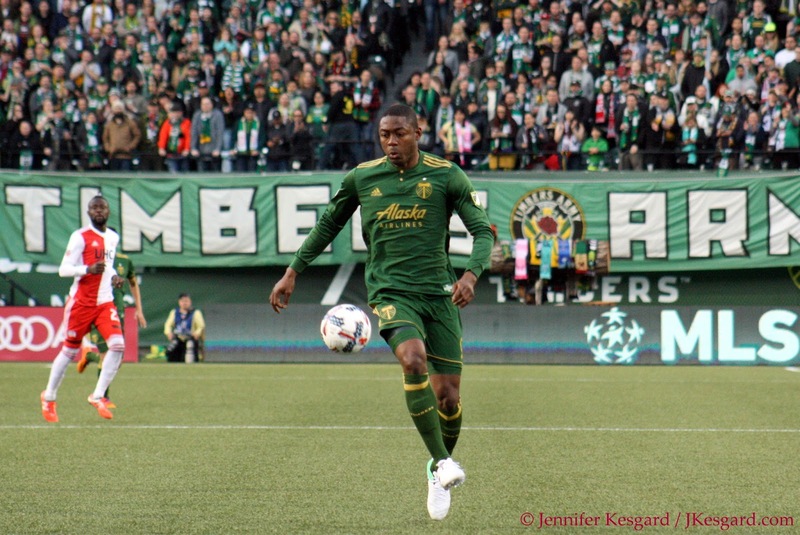 After the dust has settled with just 4 days before the 2018 MLS season starts, what can we safely say we know about the Portland Timbers with any certainty as March rolls in? We have 34 matches to get everything sorted out before October - that we can all be certain about. Anything else we saw during pre-season and practices could change at a moment's notice, especially noting how form and injury can alter any well thought-out tactics. To quote our former coach, it's important for the Timbers to keep their highs low and their lows high with proper perspective. No team wins a championship in the first month of the season, but it can certainly be impacted or slowed down. The 2015 MLS Cup side started out the year slowly, but peaked as the calendar turned to summer and the rest is history, but that's not the only way to win a trophy. Last year's winner, Toronto FC, was simply outstanding from start to finish with only a few hiccups along the way, while we aren't that far removed from FC Dallas nearly pulling off the treble of winning MLS Cup, U.S. Open Cup and Supporters' Shield all in one campaign. Sebastian Blanco has been in camp and seeming very engaged. which is good. It's just in reading social media and other outlets, there has already been tremendous discussion about what the Timbers need to do, and they haven't even played a meaningful match yet in 2018. In the action witnessed, I can't even point to any of the matches where I felt the team put together a comprehensive 90 minutes of work either - it was good in stretches, not so good in others with a few sprinkles of awful thrown in for comparison. Since it's still February for a few hours, this isn't the worst thing that could be said about Portland at this point - considering that Savarese and his coaches haven't even put a full strategy yet. This doesn't mean that there aren't questions that need to be answered within the first 2 to 3 months of the year, but for me, keeping the expectations as simple as possible is paramount for me. It might not be as interesting to write about as a juggernaut or a complete dumpster fire, but in keeping the perspective simple doesn't mean that I'm not looking to Savarese to address a few key components. Center Back Questions: I like Ridgewell and Mabiala because of their experience and calm under pressure, but they aren't the fastest players. Not that the Timbers need blazing speed in central defense as they possess it nearly everywhere else, but Portland has been pried open in the pre-season when Liam or Larrys is off their line by the slightest and they just don't have the recovery speed to fix the issue. 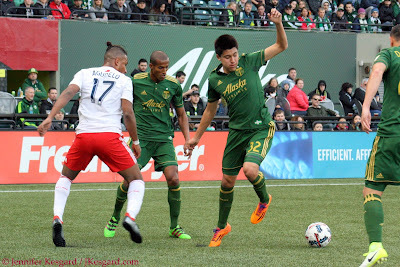 Portland's record with Ridgewell starting is very good, and he's a great influence on the back line, but Savarese needs to decide if he's willing to take this approach because of stability or roll the dice eventually with Cascante, Tuiloma or Jadama. The big question for the Timbers among many is how far can this defense carry them because offensively they will score goals; it's really all in how many they concede. Play Some Of The Kids: Okay, I know this is the tagline of a podcast about Timbers 2 run by Kevin McCamish that talks about the Timbers' main affiliated side, but I'm stealing his tagline for this point. For some of the younger players, it's time to see what they can contribute - and I'm looking strictly at Marco Farfan. Based on the eye test and his statistics, I see him as very comparable to Vytas, Valentin and Powell and there isn't much of a drop. I'm not discounting Vytas' versatility, Valentin's scrappiness and Powell's - well, we like Alvas - but the disparity isn't so much to me that we shouldn't see more of Farfan provided he is healthy. I compare this to the situation with Ebobisse, who I like his long term prognosis as a striker, but I can't see Savarese benching or reducing minutes for Adi or Armenteros at this point based on history and the eye test. The difference between the second year striker and the 2 veterans is wide enough that I'm expecting to see one or more of the veteran strikers as consistent starters, especially considering the form Armenteros is on right now. I hope to see a lot of this guy in 2018. The Diego Chara Quandary: Chara has been nothing but pure class since he joined Portland in 2011, and he's contributed to the toughness and organization on the pitch. When he's not available, the central midfield has been erratic to account for all the skills Chara possesses - making quality passes, defending, creating turnovers, executing well timed fouls. With Diego still healing and getting to fitness after last year's broken foot, the question has been who to pair Guzman with. The options at this point are Olum, a player who spent most of 2017 playing center back due to injuries, and newly signed Paredes. Paredes has been much more composed and solid, but at just 19 years old, is he too raw to be thrown in at the start? While I'm thinking Olum starts initially, I think Paredes will push for time, and this will be interesting to see how it shakes out, especially since Guzman will be out for some time this summer playing in World Cup 2018 for Costa Rica. Portland has always been trying to find the long term replacement for Chara, and maybe we are seeing it happen, but at the same point, I don't see Chara exactly going away anytime soon either. Stick To Master Plan: Savarese has said over and over that he wants to use various combinations based upon fitness and matchups, but that the players that play are the ones that put in the work. 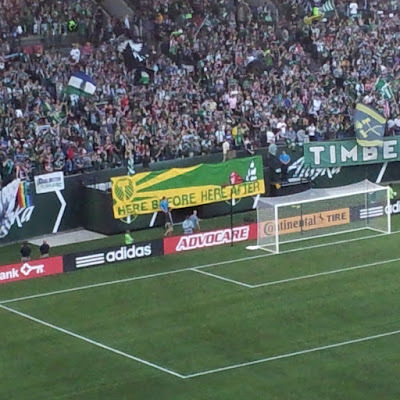 I've heard more than a few people state that there are Timbers that should play each week no matter what, and I'm not entirely convinced that is a good idea. Nobody should be using their history to justify their starting role if they aren't willing to work - although history does give some indication to any potential. I love Valeri and what he's done for this franchise, but I still want him to be hungry and fight for his spot like anybody else - and if need be, give him a chance to rest now and then if needed. Squad rotation is paramount over a long season, and while it would be great if Diego repeated his 2017 performance in terms of goals scored and assists, it's important that this offense remain balanced and hungry. That means keeping players fresh, rotating where needed to keep up peak effort, and mixing things up enough to throw off opposing defenses. I hope to return to this view for game days. And maybe see the real Nat about. Pick A Starting Keeper: I don't necessarily care who starts for the Timbers at this point, as Gleeson and Attinella both have good points and areas where improvement is needed. Attinella showed an ability to be consistent down the stretch in 2017, which has been a knock on him over his career when Gleeson was injured but I imagine that both will get ample looks to see who works best with the backline. Portland hasn't had a consistent starter in goal since 2015 when Adam Kwarasey earned the majority of the starts, so it's paramount to find the player that works best overall. 2016 saw Gleeson take over for Kwarasey when he was injured, and his performance was enough that Adam was traded away upon his recovery; Gleeson remained the starter in 2017 until he was injured and Attinella took over late in the year. Playing a consistent keeper is usually a strong component for a cup run, so it will be imperative to find which one of these guys is the long term answer. Don't Panic. Seriously: With Armemteros being in such great form early, Polo and Flores contributing well and Blanco resuming his solid efforts, there have been lots of speculation about moves. Many of them involve selling a certain striker that has been a consistent scorer, but his 2017 ended with a hamstring injury and a very lengthy and frustrating recovery. 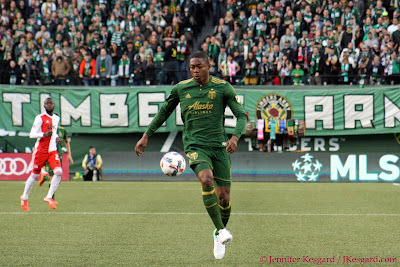 Now healthy, a healthy Fanendo Adi will give the Timbers another viable attacking and scoring option that teams must prepare for. Just because of the strong start of others doesn't mean a trade is a good option at this point. Adi's injury last year left the team with only 2 healthy forwards in the stretch run - and the team traded away one of those options in the offseason. With 5 forwards on the roster and plenty of questions for each - Can Adi stay healthy? Can Armenteros keep up the pace? How will Ebobisse evolve in his second season? Can Langsdorf bring his collegiate success in scoring to MLS? Can Polo find his place within the offense - now isn't the time for any rash moves. I'm getting more excited about the season starting this weekend, and while predictions will be forthcoming soon, I'm looking forward to writing more about Timbers Army history over the next few months as well. The start of the season is a great indicator that the spring and summer months are coming soon, and there will be plenty of exciting and potentially frustrating moments forthcoming. It's always an entertaining ride, especially for those that are RCTID. Bring on 2018! !